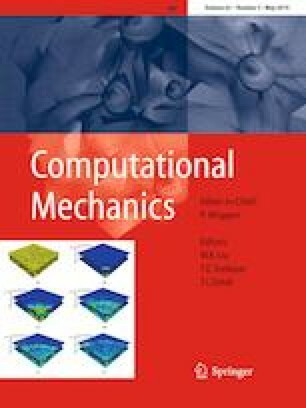 The computational modelling of fiber-reinforced structures is of prime importance for automotive products such as tires, airsprings or hoses and for biomechanical applications as is the case of arteries. In the first part of the paper, we outline the development of invariant-based constitutive models suitable for fiber-reinforced materials within the context of the phenomenological modeling approach. The polyconvex strain energy function for fiber composites is adopted from the literature and split into different contributions, which encompass the energy of the fiber, matrix, and the fiber-matrix interaction respectively. Experimental data from the literature are used to validate the model at hand. In the second part of the paper, the residual stress and damage effects are incorporated into the constitutive relation by exploiting an invariant-based representation and using an isotropic damage formulation, respectively. It is considered that residual stresses can arise in such fiber-matrix composites due to processes from different signature and affect the overall lifetime. The proposed formulation is implemented into commercial finite element code ABAQUS/Standard and is examined by means of several applications, showing a high robustness and reliability. N-K Jha and J Reinoso are grateful to the support of the Spanish Ministry of Economy and Competitiveness/FEDER (Project MAT2015-71036-P).